“Ideas are great, but execution is everything.” This statement by Eloquii founder Mariah Chase at Wide Awake: A Day For Female Founders was the overarching theme of a conference organized by female founders for female founders that debuted on March 6th in New York City, just before International Women’s Day. It’s almost unfair to describe Wide Awake’s intimate, interactive experience as “a conference.” After all, most women’s conferences — inspiring as they may be — are a one-sided affair. Famous names preach their philosophies from a grand stage to a crowd of hundreds, and you leave filled with big dreams of what you too might achieve one day. But then what? How do you go from the person listening in the audience to the person sharing her success story up on that stage? The “then what” is precisely what four hugely successful women want to teach female entrepreneurs, helping them acquire the skills, tools, and connections they need to create a thriving business from soup to nuts. 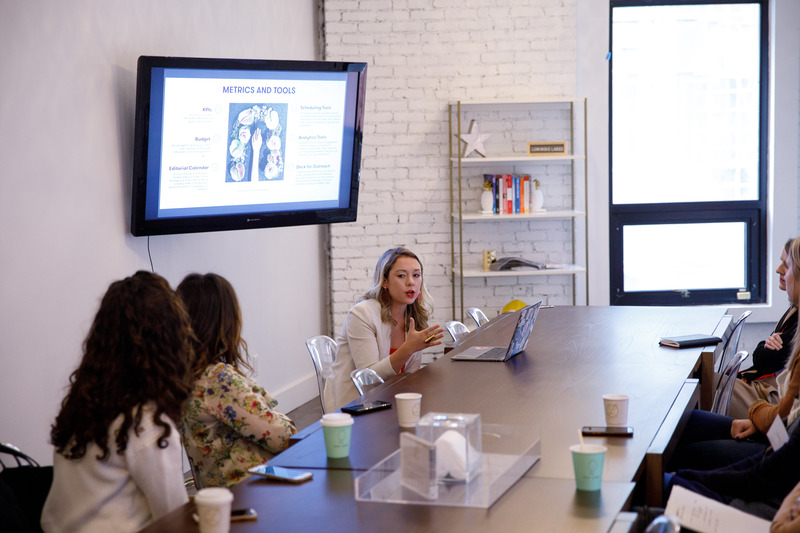 “You may have an amazing idea for a company, but that doesn’t mean you’re skilled in all areas of starting and running a business,” says fashion designer Rebecca Minkoff, one of the event’s organizers, who last fall launched the Female Founders Collective, a platform for women leaders to connect with one another and support each other’s businesses. To help educate and empower women, Minkoff and Jennifer Meyer, founder of Jennifer Bett Communications — a media relations company whose client roster is 80 percent female-founded companies — teamed up with Meyer’s business partner Melissa Duren Conner and Cate Luzio, founder and CEO of Luminary, a women’s co-working space and community in New York City where the event was held. The four created Wide Awake as a forum for female heads of successful businesses to share what they know and have learned along the way with entrepreneurs whose companies are brand new. Scrapping all traditional conference formalities, Wide Awake was free to all attendees, who got to connect directly with 39 female leaders in tech, fashion, finance, and more. In between keynote speakers like Arielle Charnas of Something Navy, Carly Zakin and Danielle Weisberg of theSkimm, and Sallie Krawcheck of Ellevest, attendees broke off into small group sessions that served as educational workshops hosted by CEOs and business heads where they could chat one-on-one with these influential women. Here are five of the most valuable pieces of advice shared at Wide Awake that can help you flourish in your career. We all have big ideas brewing, whether it’s a concept for a company or a way to expand your current job role. “The best way to convince people to take a chance on your idea is to show them how it solves a problem,” says Mariah Chase, founder of Eloquii clothing. If your idea is creative, like say a plot for a novel, identify why it’s unique and unlike any other story out there.